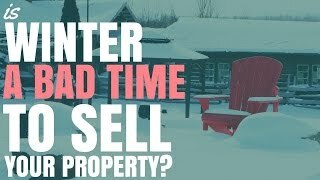 Is Winter A Bad Time To Sell Your Property? Is Winter A Bad Time To Sell Your Property? Is Winter A Bad Time To Sell Your Property? Is winter a bad time to sell your property? Common knowledge and experts say it is a bad time, but the data tells a completely different story altogether. A lot of experts say that winter is the worst time to sell your property, with spring being the best. But is winter actually a bad time to sell your property? Is this idea based on fact or is it just something that people believe, but isn’t actually true? There are a lot of preconceived notions around the best time to sell your property. A lot of people believe that spring is, by far, the best time to sell your property because your garden is going to look nicer, the light in your property is going to be better, it’s warmer, it’s nesting season. There are a lot of reasons that people give for why spring is the best time to sell your property. They also say that summer can be a good time as well because, obviously, it’s very sunny, it’s very nice. And they say that winter is a bad time to sell your property because it’s darker, it’s colder. For some reason, they believe people aren’t buying properties in winter. This belief or preconceived notions around winter being a bad time to sell your property. However, I wanted to discover whether it’s actually true so I got in contact with Jeremy from dsrdata.com.au who’s my go-to guy when it comes to data and research about an area or about the Australian property market. We’ll definitely be talking about his website, dsrdata.com.au, which is great for doing research. He sent me this graph, which is the average DSR+ country-wide. So DSR+ is a figure of demand-to-supply ratio that pulls in a lot of different statistics. I think it’s over 15 or 20 different statistics, could be even more, to understand what the demand versus the supply for an area is. If we’re looking at winter is a bad time to sell your property, for me, a bad time is when there’s supply but there’s no demand to buy your property so things are going slow. And so, we want to see a dip in winter in terms of demand-to-supply ratio. Now, 50, if you can see the graph, if you’re watching the video, if not, I’ll describe it to you. 50 is the equilibrium or the theoretical median where demand is actually equal to supply. And so, for the majority of the time since 2010, average demand versus supply has been over 50 and we saw a drop in 50 around 2011, 2012 and then growth in the demand-to-supply in 2013, 2014, 2015. We’re looking at this graph and what we would like to see is dips where it says “7” because this is July and so, “7” and then after July or slightly before it, slightly after it, so June, July, August. And so, 2010, there’s no dip in winter, it’s just flat. If we look at 2011, then it does dip in winter, but it actually ends up at its lowest point in summer. So it’s dipping in winter, but also dipping through spring, lowest point in summer. Okay, we’re then going to 2012 and we see this massive spike in demand-to-supply ratio in 2012 and then a dip in I think that’s August there, but then it kind of levels off across spring. We’re then seeing in 2013 a rise. And if we look at winter here, we can see a tiny dip, but then it continues to rise. If we go across to winter 2014, then we can see, just before winter, it has gone up and then kind of stayed steady across winter, dropping in spring and summer. And then, 2015, where it’s steady in winter as well. So we’re not seeing a drop in winter that we can compare to summer or we can compare to spring and say that this is different. This graph is just all over the place and Jeremy did say when he sent me this that there are going to be some anomalies in the data in terms of census data is only updated every 5 year, as well as some data is delayed by a few months. But given the fact that there’s so many different things that affect an area, like there’s political things, there’s government incentives. If we look back to 2009, in New South Wales, we saw the end of the first homeowner’s boost in September. There was a huge growth in winter, leading up to the end of that boost. Because if you purchased after the date that boost ended, then you wouldn’t get as much money from the government. So, winter in 2009 for New South Wales was actually quite a great season, given that the boost was ending in September. There’s just so many different factors that go into the demand and supply of an area that for someone to go out and say winter is a bad time sell your property is just, frankly, it’s false. Jeremy did provide me with some awesome data as well. And this is the average DSR since 2010 for the different seasons. So we got spring, summer, autumn, winter. And these are the months that define spring, define summer, define autumn, define winter. So winter would be June, July, August. Spring would be September, October, November. Summer would be December, January, February. Autumn would be March, April, May. That’s just how we generally categorize it in Australia. So the belief is that spring is the best time to sell your property and we can see from the data that spring does have the best DSR or average DSR since 2010, a 55.89. Now, we would believe that winter would be the worst time to sell your property, it actually has the second-highest DSR of 55.84. Summer then has the third-highest with 55.81 and Autumn is on the bottom with 55.49. But if you look at the difference between spring, summer and winter, you’re looking at a 0.08% difference or 0.08 in terms of the DSR. “Percent” is probably not the right term. But very, very small we’re looking at here. Even autumn is only about 0.3 between autumn and summer or potentially almost 0.04 between autumn and spring. We’re talking very small changes in DSR between the lowest and the highest. And so, really, I would not like to draw any conclusions from this. Obviously, it does seem to say that spring is the best, but given the limited amount of data here, like, this is just average DSR and given how close things are, I wouldn’t then say spring is definitely the best time to sell your property, winter is the second best and autumn is the third best. Really, when it comes to the question when is the best time to sell your property, I think the answer is, unfortunately, it depends. If you are ready to sell and it’s winter and you’ve got great demand-to-supply in the area, then it might be best to go ahead and list your property. There’s a lot of things that you need consider, but mainly, you need to consider the market that you’re in and what the market is like. If it’s a great time to sell and a lot of people are keen to buy and it’s winter, then maybe it’s not worth waiting until spring because what if the market cools down by then and you find it harder to sell your property. In a lot of property cases, especially around Australia where we don’t have extremes of temperatures, there’s very few areas where you’re going to have snow for your property. When does your property stand out? I live on the Gold Coast, so it’s basically going to be fine all year round. December, January are the hottest times and so, if you don’t have air conditioning in your house, that could make it more difficult. But really, the weather is pretty good across Australia for most of the year. You also want to ask yourself, “Is there high enough DSR right now?” If you’re looking at selling your property, is the demand-to-supply ratio there? Where there’s people looking to buy properties and there’s not an over supply of properties in your area. You also want to ask yourself what will you actually gain by waiting? I find that it’s very interesting to try and put a money figure to this. Let’s say I’m selling my property and I’m selling it for $500,000 and it’s winter and I think my property is worth $500,000. Well, what am I going to gain by waiting 3 months until spring? Am I going to get an extra $10,000, $20,000, $50,000? I’m probably not going to get an extra $100,000. So how much am I actually gaining by waiting? If you can’t answer this question, then talk to real estate agents in the area and ask them, “What do you think I will gain by waiting?” and you’ll probably get the answer that you’re probably not going to gain much. You also need to consider what might you lose by waiting. Because the fact is, if you’re in a hot market right now, the longer you wait, the higher the chance that eventually, that market is going to cool off and it’s going to be harder to sell your property. So you really need to weigh the risk versus the reward. What am I going to gain by waiting? Maybe I might gain an extra $5,000, $10,000. What am I going to lose by waiting? Well, if I wait and the market does cool, then I might have to hold this property for another 3 months, which is extra mortgage repayments. I might get $20,000 less for my property, you know, every situation is going to be different, but you might want to consider what have you got to gain, what have you got to lose and work out what’s the risk versus reward there. Looking at the data, looking at the graph that Jeremy provided me, it’s just not very clear that winter is a bad time to sell your property. And looking at the average DSR, then winter is right up there spring and summer in terms of having high DSR in those seasons. If you want to check out the DSR of your area, just go to dsrdata.com.au and you can go ahead and you can just simply type in your suburb. So, let’s type in “Cronulla”, which is a suburb in Sydney, and we can see that the DSR for Cronulla is 71 out of 100. So 50 is the equilibrium, so 71 is quite high. You can go ahead and login to see even more information. We can actually look at the trends of demand-to-supply ratio there. We can see how it’s grown in the past, even though it’s only grown slightly. We can look at things like days on market and whether they’re growing. One of my favourite things to look at is the average vendor discount. That’s one of the favourite ones to look at, you can see how much they’re discounting their property. We can see that back in late 2015, it was actually a negative. Which means people are paying more than the listing price for properties and we can see that that is starting to drop. So if I’m looking at Cronulla, I’m thinking maybe it could have peaked around late 2015 and we’re seeing larger and larger discounts being applied to properties in order to get them sold. Now, this doesn’t mean the market is going down, it could still be growing, but people could be a bit ambitious in their asking price. Whereas, back in 2015, people were just offering above and beyond what things are listed at. There’s some great data in there. Go ahead, check out dsrdata.com.au, it’s an absolutely extremely valuable resource. If you’re an investor and you need help researching an area so you can understand whether or not that that area is likely to grow or if it’s a bad area to invest in. Then I do have a course on that, which you can check out by going to onproperty.com.au/research. I go through a whole bunch of different things you can look at for each suburb and I provide you with a checklist you can fill out for each individual suburb. So when it comes to “Is winter a bad time to sell your property?” I think the answer is inconclusive. I think it doesn’t look like a bad time to sell your property from the data. However, I don’t think we have enough data to actually tell that. I think, really, you need to look at your personal circumstances and whether to sell now. And you need to look at the risk versus the reward of whether it’s worth waiting until spring and you think that the market is going to grow and there’s going to be more demand for your property in spring versus the risk that the market might cool off and you might actually have a better chance of selling in winter. So, I think it’s less the seasons affecting the demand and supply versus area-specific things affecting the demand and supply. So always do your research before listing your property and don’t just rely on the seasons to determine when you sell your property. I’m Ryan from onproperty.com.au and until next time, stay positive. Let’s Talk About The Australian Housing Bubble	Should You Buy A House With Tenants In It?